It is not up to me to tell America who they should allow into their country, but I think it is right to demand a clear explanation of who is excluded and who is not. Visitors to US have the right to know beforehand whether they qualify for entry and not have to face a humiliating procedure at the airport, and this has been my bone of contention with Trump's visa ban, the ambiguity and unclarity of it. 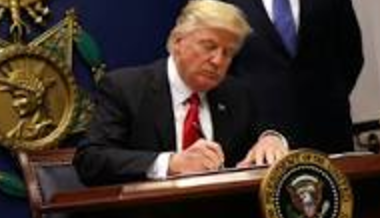 When the executive order was first signed by the new US administration, there were many ambiguities, made worse by the anti-Trump media frenzy. The UK Foreign Office issued a statement which clarified many points, but the US embassy failed to do the same and in fact by changing the statement on their website 3 times, and contradicting the UK Foreign Office statement, they made things even more unclear! In the last revised statement one paragraph even contradicted the previous one. We'd refer you to DHS for any information. Which was about as useful a response as a water resistant tea bag! There is however another side to the story which the mainstream media have failed to report. For more than 3 decades, the Islamic Republic of Iran has exploited the lack of proper vetting by Western countries, and have sent their agents, lobbyists and sleeper cells to establish firm roots on Western soil and this poses a very serious security risk. do you realise what we can do? which will say “Disintegration of USA” "
So what are your thoughts on Majid Nawaz and Brexit? I see you retweet Tommy Robinson's stuff - isn't he equivalent to someone on the American alt-right? Btw, travel ban will never get a judicial stamp of approval. No, Tommy Robinson is definitely not Alt-Right, they are white supremacists, Tommy Robinson is not. Read his book "Enemy of the State"